Vienna, January 2013 – The Blue Heart Campaign has gained additional support with new initiatives around the world. Switzerland became the latest country to join the Campaign, and in Colombia and the Republic of Serbia, cinema and theatre have been used to generate awareness and serve as a stark warning to potential victims about false promises of a better life. Under the title “What are we in Switzerland doing against human trafficking?”, 250 representatives from the federal government, cantons and civil society met in Bern, Switzerland, to discuss concrete steps to address the issue. Simonetta Sommaruga, Head of the Federal Department of Justice and Police (FDJP) also launched the Swiss National Action Plan against Trafficking at the event, reaffirming the country’s political commitment to the issue. Ambassador Claude Wild, Head of the Human Security Division of the FDFA, outlined how Switzerland cooperates with international bodies to refine international standards and norms to combat human trafficking. The protection of domestic staff in diplomatic households, for example, is one of the issues that Switzerland is taking up in collaboration with other states. In a regional conference held in Belgrade on 15 October 2012, and upon the initiative of the Republic of Serbia, a strategy for the regional promotion of the Blue Heart Campaign in South East Europe was also adopted. The Republic of Serbia joined the Blue Heart Campaign in 2011 with the production and distribution of the film Sestre (The Sisters), an effort in support of the Blue Heart to prevent trafficking in human beings. The film, directed by Vladimir Paskaljević and produced with the support of the European Union, the International Organization for Migration (IOM) and the Government of the Republic of Serbia, is based on the true story of two sisters from Krusevac, Serbia, who decide to accept a part-time job in Italy. Soon they become victims of organized crime and forced into prostitution, and the production vividly depicts their struggle, as well as the difficulties they encounter once they have escaped. The film is still being widely used as an educational tool, and while its main aim is to inform young adults about the potential dangers of seeking jobs abroad, it also serves as a training tool for judges, prosecutors, and law enforcement agents. Since its launch, the film has also been shown in neighbouring countries and has been aired on Serbian national television, where approximately one million viewers tuned in to watch. Around 3,000 posters and 10,000 DVD copies have been distributed to support prevention efforts among young people and specialized professionals such as the local police, social welfare centres, courts and civil society organizations. 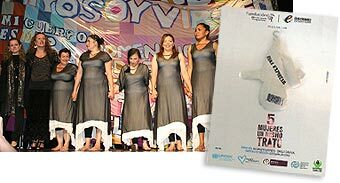 As a sign of its commitment to generate space within the arts to key social issues in Colombia, the Marcela Loaiza Foundation, in association with Casa Ensamble and supported by the Colombian Ministry of the Interior and UNODC, produced a play, ” 5 Mujeres un mismo trato”, detailing the experiences of Colombian women who have been subjected to human trafficking. The premiere took place in Bogota on 20 November 2012 before a full-house, and plans are in the pipeline to present the play throughout the country and abroad in 2013. Directed by actress Alejandra Borrero and Camilo Carvajal, ” 5 Mujeres un mismo trato” depicts the journey of five women searching for a better life who end up trafficked and putting their lives and dignity at risk. With references to fairytales and mythological symbols, the play responds to the need to create urgency around the issue of human trafficking in Colombia. The Blue Heart Campaign seeks to encourage involvement and inspire action to help to stop the crime of human trafficking. 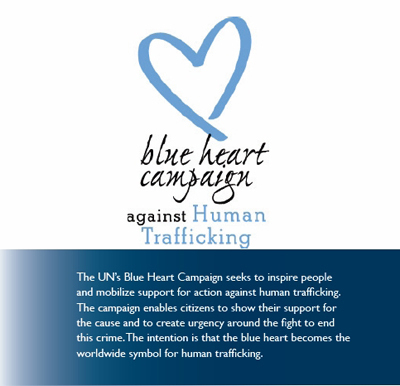 It allows people to show solidarity with the victims of such trafficking by wearing the Blue Heart, an international symbol against human trafficking.